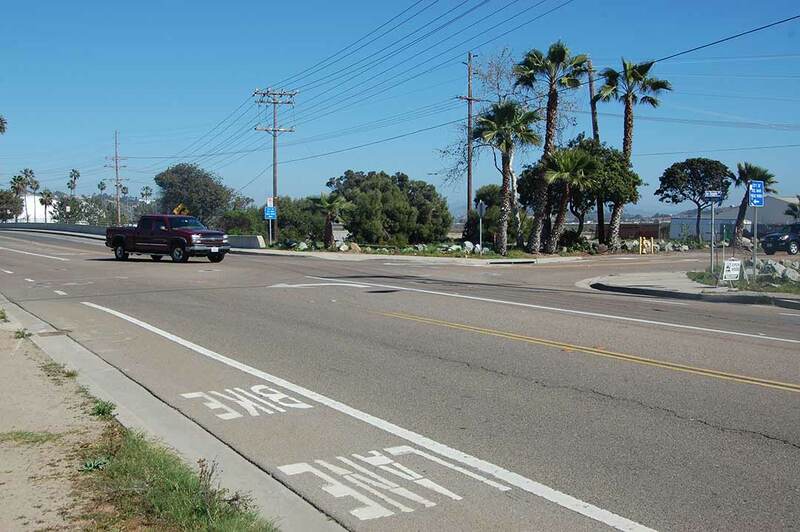 DEL MAR — Del Mar’s first roundabout will be built at the intersection of San Dieguito Drive and Jimmy Durante Boulevard. Council members at the March 21 meeting deemed the environmental impact report adequate and authorized staff to complete the final design and advertise for construction bids for the traffic calming device. After analyzing three options — including no change to an existing stop sign and a traffic signal — the EIR consultants determined the roundabout to be the environmentally superior alternative. According to the study the rotary will provide improved traffic circulation for conditions through 2035. It also offers benefits to local air quality, greenhouse gas emissions and noise and meets the objectives of improving the pedestrian and bicycle experience identified in the community plan, according to the staff report. Councilman Al Corti, who could not take part in the 4-0 vote because he lives on Jimmy Durante close to the project site, said it’s not uncommon for motorists to exceed the 40 mph speed limit. A frequent user of the intersection as a driver, walker, bicyclist and motorcyclist, he said he supports the roundabout. So did resident Hershell Price, who said a stoplight wouldn’t “fit into the city.” He said his only request is that it not be too small. The roundabout will be approximately 100 feet in diameter and include curbs, gutters, pedestrian ramps, sidewalks, landscaping and signage. Two residents submitted an email also in support of the rotary after they witnessed a mother leaving her baby in a stroller on the side of the road to grab her other child who ran into the street. Four other speakers, all residents of the San Dieguito Drive canyon area, opposed the project, saying it would intensify an already gridlocked area during events at the nearby Del Mar Fairgrounds. That said getting in and out of their neighborhood is already difficult enough. They also expressed concerns about the ability of fire trucks and ambulances to respond to emergencies. Beth Westburg said people leaving the fairgrounds often make illegal U-turns there and at other areas to get to Interstate 5. She said more people will use the roundabout to get back to the freeway, which will further exacerbate traffic. Studies have indicated not much can be done to alleviate heavy traffic at the intersection during the San Diego County Fair and horse race season. So as a condition of approval flagmen will be required to direct motorists at the intersection during those events. A hotline will also be set up so people notify city staff when traffic is unusually backed up. Simulations have shown that emergency vehicles have the ability to maneuver the roundabouts in traffic and can drive over the low curbs. He said fatalities and rear-end collisions are frequent at traffic signals and rare at traffic circles. “My primary concern is the safety of our citizens, our pedestrians, bicyclists, our motorcyclists and the people driving their cars, and roundabouts win for each of those user groups,” Mosier said. Councilman Dwight Worden noted that U-turns would be legal at the traffic circle, thus increasing safety citywide. “The world will be better for U-turns with a roundabout,” he said. “For 99 percent of the time it is going to be a great asset to the community,” Councilman Terry Sinnott said.